What, you might be wondering, might a wordless, slapstick, burlesque, Francophone show – such as Bigre – be like? 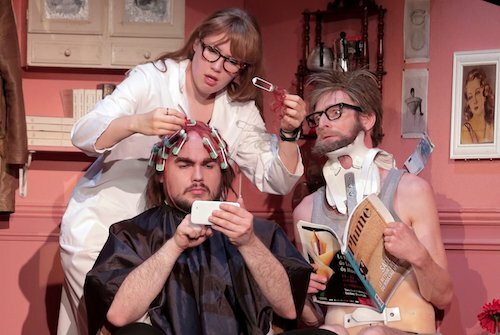 I went to Canadian Stage to discover, and found the answer to be: a little lewd, a little rude, and ultimately pleasing, if you come ready to laugh. Overall, Bigre is a show designed to be patently ridiculous. Hung loosely on a frame of three neighbors in tiny, top floor apartments trying to maintain both some community and also some privacy while living cheek-by-jowl, the show has a crowded, overflowing feel – lots of things and not enough space, lots of jokes and not enough time. Everything that happens, in the physical world of the show, is two things – on the one hand, general-duty nonsense performed with superlative comic timing. And on the other, an illumination – or skewering – of the ways in which human feelings and interactions are often larger than there’s room for. The cast rotates, and I saw Jonathan Pinto-Rocha as the obsessively tidy and self-important left-hand neighbor, Pierre Guillois as the… somewhat less tidy middle neighbor and Eléonore Auzou-Connes as the accident-prone right-hand newcomer who takes possession of the third room and rather upends what has evidently been a one-dimensional drama before she arrived. As the specter of heterosexuality rears it head, the type and manner of shenanigans ramp up precipitously – there are many, many jokes about or while wearing one’s underthings, which are ridiculous and sometimes sexist (a dumb blonde? Really?) but even when the writing/creation lags into stereotype the performances are sharp, sharp, sharp. But at the end of the day, billing this as burlesque is… a questionable choice. My suspicion is that the company chose that in order to make it sound more adult and sophisticated (despite, it must be said, a fair bit of toilet humor – literally). Actually, by my lights, Bigre is classic clowning, and clowning done well for that matter. The tension is held very nicely among the triad, with power and attention shifting seamlessly back and forth – everyone’s foibles are both mocked and accepted; all the characters seem both ridiculous in their excesses and commonplace in them too. The sound design by Roland Auffret and Loïc Le Cadre, where there’s obviously an entire Foley department’s worth of things for making perfect sound cues, is tremendous. Bigre is tight and quick and universally understandable. Even though it sometimes achieves that by sacrificing nuance for stereotype, I still found it a charming (and funny) work. Bigre is playing at the Berkeley St Theatre Downstairs (26 Berkeley St) until April 28, 2019. Performances run Tuesdays through Saturdays at 8:00 pm (Fridays at 7:00 pm) with Wednesday matinees at 1:00 pm and weekend matinees at 2:00 pm. Tickets range from $29 to $89 and can be purchased online, over the phone by calling 416 368 3110 or in person at the box office. Audience Advisory: This performance contains smoke, loud noise and flashing lights.